Palestinian citizens of Israel return to the village of Al-Ruways, which was destroyed by Zionist military forces during the Nakba. Palestinian citizens of Israel, joined by Jewish Israelis organized by the activist group Zochrot, return to the destroyed village of al-Ruways, March 30, 2013. All structures in Al-Ruways were destroyed and the original residents forcibly displaced to nearby Tamra by Jewish militias in the Nakba in 1948. The Israeli group Zochrot organizes many tours of Palestinian villages depopulated during the Nakba of 1948. What made this Saturday’s tour of Al-Ruways particularly remarkable was the large number of displaced Palestinians and their descendants who made the event more of a return than a simple tour. Zochrot, whose name means “remembering” in Hebrew, aims to educate Israeli Jews about the history of the Nakba and the Right of Return for Palestinian refugees. Typically, they will arrange for one or two refugees to help guide a tour of their home village, telling those who attend about life in their village before the Nakba, and the events leading to their displacement in 1948. This week in Al-Ruways, dozens of local Palestinian residents of Israel were on hand for the return to Al-Ruways. Led by village elders who lived through the Nakba and experienced the displacement firsthand, the large group walked through the land of the village, marking various sites with signs to remind future visitors of the town’s existence. Such a large turnout of Palestinians was possible because when this village was forcibly evacuated by Zionist forces, they were simply pushed to the nearest town, Tamra, which remains until today. The residents of Al-Ruways were told by the Jewish militia leaders that after two weeks, that they would be able to return to their homes. Of course, as in many similar cases throughout what became the State of Israel, the displaced Palestinians were never allowed to return to their homes, even though they continued to live just a few kilometers away. The village itself was completely destroyed, with few visible traces remaining other than the cemetery and occasional pieces of rubble. Recently, the mayor of Tamra has attempted to negotiate with the Israeli Interior Ministry to have the land of Al-Ruways added to Tamra’s village lands. Though the change has yet to be finalized, the tentative agreement hinged on one condition: that there would be no new building on the land of the long-demolished village of Al-Ruways. Palestinian Israelis plant a sign marking the destroyed village of Al-Ruways. A village elder leads the group as they walk through the remains of Al-Ruways. A local resident holds a shell casing found in the destroyed village of al-Ruways. Palestinian Israelis mark the site of the mosque in Al-Ruways near a patch of saber cactus, itself a symbol of Palestinian steadfastness. Children explore the cemetery of Al-Ruways, one of the few remaining visible traces of the village. Palestinian citizens of Israel find a grave marker pictured in a guide book published by the activist group Zochrot, whose primary mission is to educate Jewish Israelis about the history of the Nakba. The word “Palestine” is written in painted rocks on land belonging to the destroyed village of Al-Ruways. Nice. Teach school kids that they live in Palestine,not Israel. The future is looking grand. Now, now, Joel, did you forget “Never Forget”? Thank your people for bringing about the nightmare of the Jewish state that will eventually have to be brought to an end. As not Jew should or would disalow their history, so should no others. Joel, history is a fact, something that you can’t change. Historically, there is no “Palestinian People”. That’s a fact. Trespasser: I guess the first Jewish Talmud, called the Palestinian Talmud and the two thousand year history of the Palestinian Jews didn’t exist either? LOL, what a nut. I might be a nut, but you certainly are an idiot. Nice, teach Jewish kids to ignore the fact that Israel is built on a Palestine they destroyed; or to justify the theft of Palestine based on religious fantasies about a short-lived kingdom which probably never existed 3,000 years ago. Let’s pretend we are more important than the indigenous population, shall we? I suppose these fellas wouldn’t mind to be stripped of the bloody Zionist citizenship and granted their beloved Palestinian citizenship. and stripping them of their memory is the only alternative? It does make things more comfy for us, doesnt’ it? The only alternative to what? Little by little Judaism is healing her wounds; with each wrong put right and each life lived free. There will be peace in our lifetime; and it will happen no matter how hard Zionism fights it. Judaism will free herself of the chains of Zionism. That is a future worth investing in. How do you get to there? Jews, not “Judaism,” are still keeping these people from their homes. Where’s the healing in that? And what’s the good of Judaism healing itself, when Palestinian wounds are still open? It is so lovely, when people who have no idea about Judaism or Jews are discussing their relation. Palestinian Arab wounds are still open, right, however what does it have to do with Jews/Judaism/Zionism? 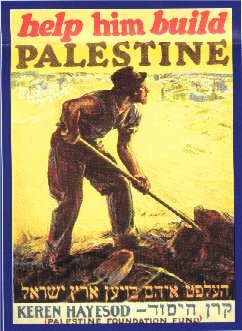 Jews haven’t prevented Palestinian Arabs from creating bi-national state in 1919, or proclaiming nation-state in 1947 or 2000. You get there by breaking down every single Zionist barrier. I did it by simply driving past the dreaded “BEWARE out there be monsters” neon red signs. Palestinians are our kin and if they be those monsters out there those signs keep warning us about; then really we’re the monsters for believing those signs in the first place. The point is: We are safer when we are all equal; and to be equal we have to step over the threshold of pathological fear and put right our wrongs we commit because of those fears – starting with what we have done to Palestinians. I agree with your sentiments, Zephon, but I’m not seeing any general movement in that direction by Judaism or by Israeli Jews. Tresspasser seems to be more the norm. Trespasser is not only not the norm he is the highest form of anti-Semite. Not only has he no friends – he has no future. Israels destiny is not held up by the likes of Trespasser in the slightest. It is carried on the shoulders of those who patiently stitch wounds one stitch at a time. It takes time and decades but only because the end result is meant to endure and last. Zionism never could sustain itself, even after the dawn of the 20th century where the opportunity to plant the seed of fear was at it’s highest; for the obviously reason that it goes against the nature of Judaism. It’s like trying to convince someone to inhale underwater. Unless one is intent on killing themselves chances are they will fight to keep air and not water in their lungs. Trespasser is intend upon drowning but he’ll be drowning alone – it’s inevitable. p.s. Zionism is perfectly capable of sustaining herself, especially if not the need to spend billions of dollars to fight off terrorist hordes. p.p.s. Against the nature of Judaism? Apparently you have some very specific Judaism of your own. Okay there is something missing: The Israelis that were evicted from Gush Katif in Gaza in 200 kicked out by their own government! For once, Israel acting legally in evicting squatters. It is pure spite to forbid building, the clearest emblam of livelihood and growth, on land once lived. This effectively marks the former village site as unclean and is a marked subordination to its former residents and their famlies. More practically, it’s a precedent that Israel can’t allow because half the Jews live on lands confiscated later in much the same way. Palestinians can’t be allowed to have rights that might conceivably threaten Jewish possession. This is why, even though the courts have repeated ruled that the residents of Ikrit and Biram can return to their land, confiscated under the same circumstances, the security establishment has always forbidden it. If one Arab does it, they all could. Since the land is to assigned to the Arab village, there would be no prescedent beyond that. There is no confiscation of present owners here. As to ignoring Court orders allowing resettlement, this one again shows an immunity from the judiciary by the security apparatus; one not in the occupation, but in Israel pre-67. Although all these cases involve Arabs. All these events show how the Israeli constitutional crisis, which lurks behind many acts present, evolved. The fact is, Israel is Jewish like Italy is Italian, Poland is Polish, China is Chinese, and Lithuania is Lithuanian. All of these countries have laws similar to the Law of Return that allow their ethnic kin to settle. Look up right of return on Wikipedia for an extensive list of such laws. There is nothing unusual about Israel as a Jewish state having a Jewish law of return. Israel is a nation-state. Deal with it. The fact is, the Holocaust survivors who lost their homes, and the Arab Jews who were forced to leave their ancestral lands have no desire to leave Israel and return. The Nationalist Chinese who escaped to Taiwan, the Sudeten Germans who were forced from Czechoslovakia, and the Greeks and Turks who fell victim to the Greece-Turkey population exchanges all built lives in their new countries. The descendants of Arabs expelled in 1948 (and yes, the are Arabs, not “Palestinians”), are just going to have to learn to do the same. A small minority of Jews has always supported a bi-national state and the right of return, but with the growing birthrates among Haredim and the National-Religious, and growing aliyah of staunch Zionists from abroad, there will never be public support for a “right of return”. Even most seculars believe in the Jewish state and would be petrified of a right of return due to the fact that Israel would be flooded with millions of hostile and vengeful people, and the situation would end like Yugoslavia at best, or even like Rwanda. Correction David: Israel is not Jewish like Poland is Polish and Italy is Italian. It’s more like Polish Jews are as Polish as non-Jewish Poles, or as Italian as all other Italians. Israel has no distinct culture, just a combination of other cultures, like any settler country. Being Jewish is no more a culture than being Muslim or Christian is a culture. What is Jewish food? A Kosher version of European or Middle Eastern food. Jewish music? Eastern European music in Hebrew or Arabic music in Hebrew, a language not in use before ’48. What’s Jewish dance? There’s no Jewish dance besides maybe the Hava Nagila which is just E. European dance to E. European music in Hebrew. Jewish dress? Besides religious all-black dress, there is no dress that all Israelis wear because of their “culture”. Since the establishment of Israel, of course there has been (kind of) a unique culture slowly developing. But it’s a long way off and still a hodgepodge of other cultures – with no origin in Palestine. The Palestinians however have all of these things – a unique music, dress, history, food and all the rest of it. You might think it’s all the same as Egyptian or Saudi Arabian culture, but you actually have no idea because you’re not from the Middle East. If you want to claim Saudi Arabians and Palestinians are the same, then I guess all Americans, Canadians, Australians and S. Africans are the same too since they all speak the same language. All of Latin America is the same too according to your logic. So is Hong Kong, Taiwan and mainland China, it’s all Chinese. But wait, it’s not. Just as Palestinians are not the same as their surrounding countries. Just because you can’t see it doesn’t mean it’s not there. The Law of Return in places like Poland and Germany didn’t apply to people of only one religion. Neither to people who never lived in the country to begin with, and most importantly it didn’t EXCLUDE people were were purposely pushed out of their country (where they have roots for ages). Israel’s “Law of Return” is not about return is about the use of a religious fantasy to justify a colonial project. The problem with your arguments is that they don’t actually make any sense. They are like pseudo-arguments that Israel and Jews desperately hold on to because they know the deep down truth would delegitimize them. Hence why Israel spends billions and even builds little propaganda armies to keep trying to distort the truth and fight their supposedly biggest threat of delegitimization. >Israel is not Jewish like Poland is Polish and Italy is Italian. >It’s more like Polish Jews are as Polish as non-Jewish Poles, or as Italian as all other Italians. >Israel has no distinct culture, just a combination of other cultures, like any settler country. >Being Jewish is no more a culture than being Muslim or Christian is a culture. >What is Jewish food? A Kosher version of European or Middle Eastern food. >Jewish music? Eastern European music in Hebrew or Arabic music in Hebrew, a language not in use before ’48. >The Palestinians however have all of these things – a unique music, dress, history, food and all the rest of it. 7th lie. There is no distinct “Palestinian” music, dress, food or language. >You might think it’s all the same as Egyptian or Saudi Arabian culture, but you actually have no idea because you’re not from the Middle East. Palestinian Arabs from different regions of Palestine eat different food and are speaking different dialects. >If you want to claim Saudi Arabians and Palestinians are the same, then I guess all Americans, Canadians, Australians and S. Africans are the same too since they all speak the same language. >All of Latin America is the same too according to your logic. >So is Hong Kong, Taiwan and mainland China, it’s all Chinese. But wait, it’s not. >Just as Palestinians are not the same as their surrounding countries. >Just because you can’t see it doesn’t mean it’s not there. If you can’t show it – it is not there. >The Law of Return in places like Poland and Germany didn’t apply to people of only one religion. >and most importantly it didn’t EXCLUDE people were were purposely pushed out of their country (where they have roots for ages). >Israel’s “Law of Return” is not about return is about the use of a religious fantasy to justify a colonial project. >The problem with your arguments is that they don’t actually make any sense. They are like pseudo-arguments that Israel and Jews desperately hold on to because they know the deep down truth would delegitimize them. >Hence why Israel spends billions and even builds little propaganda armies to keep trying to distort the truth and fight their supposedly biggest threat of delegitimization. >All the Palestinians need to do is show up and the truth comes out. The truth is that Palestinian Arabs has denied Palestinian (and other) Jews equal rights. >That should tell you something.